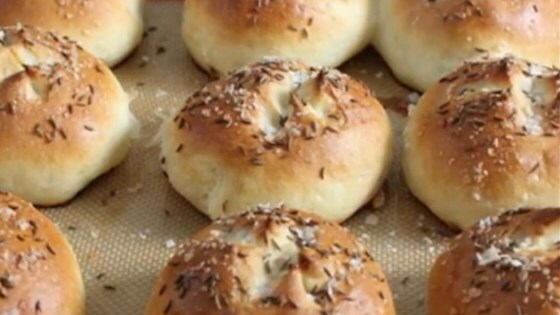 "These rolls are fragrant with caraway seeds and topped with coarse salt, making them the perfect base for Western New York's Beef on Weck sandwiches." Whisk 1/2 cup flour, 1 cup warm water, and yeast together in the bowl of a stand mixer. Let sit until foamy, 10 to 15 minutes. Stir 2 tablespoons oil, 1 egg white, sugar, salt, and honey into yeast mixture; whisk until smooth. Gradually add flour to yeast mixture while mixer is running with the dough hook attached; knead until a soft, sticky dough forms, 3 to 4 minutes. Drizzle remaining vegetable oil into the bowl and turn dough to coat. Cover the bowl and let dough rise until doubled in size, 1 to 2 hours. Turn dough out onto a lightly floured work surface, flatten dough, and press into rectangle. Cut dough into 12 pieces and form pieces into rolls. Place rolls 2-inches apart on prepared baking sheet. Cover and let rise until doubled in size, about 30 minutes. Whisk 1 egg white and 2 teaspoons water together in a small bowl. Use kitchen shears to cut an X at the top of each roll. Brush rolls with egg white mixture and sprinkle with caraway seeds and salt. I like to add about 80% of the flour called for and then continue adding small amounts as the dough kneads until I have the perfect texture. You want a soft, fairly sticky dough that pulls cleanly off the sides of the bowl. Get the recipe for Chef John's Beef on Weck sandwiches. Will definitely make these again. Used these for the Beef on Weck recipe. Everybody loved them. Magnificent!. I had never heard of these not having lived in the endogenous area where these reside, but will be sure to make them again soon. Thanks!! These were so easy to make. Took no time at all before they were out of the oven and served to the family. Beef on a Weck was awesome! LOVE these rolls! They have a great flavor and texture, I will definitely make these again. Perfect!!! Tastes even better than the ones you buy in Buffalo!